To address the issue of menstrual health, and the challenges women face with regards to access, hygiene and socio-cultural stigma, Women’s Global Empowerment Fund launched the Healthy Periods Initiative – improving health, creating livelihoods. Just imagine attending school without toilets or drinking water. Imagine attending a school with a single latrine for all the students, or that the latrine is smelly, with no toilet paper and the door no longer closes. Just imagine attending one of these schools when you have your period. Approximately 70% of reproductive diseases are caused by poor menstrual hygiene. 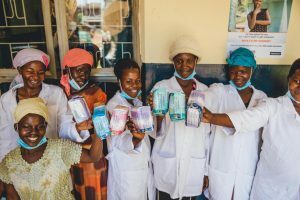 In lower income countries, and areas where there is a lack of access to sanitation and water, menstruation is significantly more challenging to manage hygienically and with dignity. 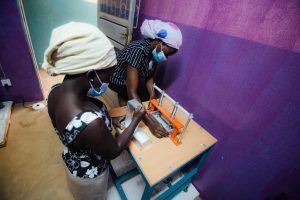 Due to the lack of access and affordability of sanitary products, women and girls often use cloth, leaves, mattress stuffing, and other ineffective and unsafe materials. These materials are unhygienic, uncomfortable, ineffective and unacceptable. Period. The Healthy Periods Initiative drives economic and socio-cultural change through enterprise and education. From a grassroots level, we inform, educate and provide resources to assist in the development of successful social enterprises that provide safe and sanitary resources for all women in their communities. As of May 2017, Uganda will be home to more than 1.3 million refugees and asylum seekers, mostly from neighboring South Sudan. WGEF is responding to this crisis by supplying Lucky Girls Sanitary Pads to young girls and women in Bolore and Pagirinya refugee settlements. These 2 settlements host 36,000 people, of which 72% are young girls, women and children between 9 to 18 years. WGEF provides 7,000 Lucky Girl Sanitary Pads each month to young girls and women, in addition to critical information on menstrual health. 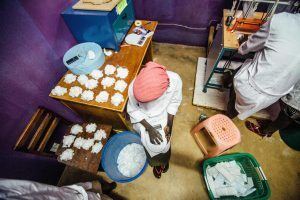 In an effort to provide this essential product to other vulnerable groups, Women’s Global supplies the Gulu Women’s Prison and local schools.